Pastor Qadir was at a Women’s Fellowship meeting, like this one, when Nand came to him and asked for prayer. Women’s Fellowship teams reach out to the women of South Asia with the love of Christ. They spend hours in prayer and fellowship with each other and with Christ. It is because of this faithfulness in prayer and in reaching out to women that they see such fruit. Remya and her husband were fighting when all of a sudden, they heard knocking at the door. It was a Gospel for Asia-supported Women’s Fellowship team. When they entered the house they saw Remya crying. The team spent a couple days fasting and praying for Remya. A few days later, the family started to attend a local church. Now the family is grateful to Christ for bringing peace to their hearts and marriage. Eshita was seven months pregnant. She was a believer but had not attended church for a long time because her family had arranged her marriage to a non-Christian man. An evil spirit began attacking Eshita and it would not loose its grip on her. One day, Eshita’s desperate mother came to the local Women’s Fellowship team and asked them to pray for her daughter. The team went home with Eshita’s mother and earnestly prayed for her daughter’s deliverance. God heard their cries, and from that time on, she was completely released from the attack of the evil spirit. Eshita went to the local church and shared her testimony about how a miraculous deliverance from the evil spirits brought her back to Jesus. Tamasi’s family was worried about her. An extremely frightening situation had caused Tamasi to lose her memory. After hearing what happened, the local Women’s Fellowship team went to Tamasi in order to pray for her. A few hours later, Tamasi was completely healed and her memory came back. Because of this miracle, the family chose to follow Christ and started attending the local church regularly. Women’s Fellowship teams are being used mightily to change the countless lives with their devotion to Christ through prayer and reaching out to those who do not yet know Him. 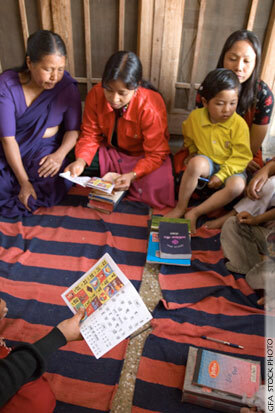 Find out about how one Women’s Fellowship taught a group of women how to read and write.